Thanksgiving inspires us to bring all we are grateful for to the seat of our hearts. But as the last piece of pumpkin pie is gobbled up, the storefronts beg us to consider all that is left to accumulate. Christmastime can certainly be swept into a rush of crossing things off our list even before we digest the cranberry sauce and emerge from turkey comas! That being said, there is a fun and childish rush that comes alongside the celebratory nature of Christmastime. Perhaps, because the greatest gift of all, the all-encompassing source of our gratitude, is celebrated throughout the season. As manger and North Pole scenes replace decorative corn and sunflowers, let us lean into the gratitude even more this holiday season and beyond, by holding these 10 tactics close. 1. Define thanksgiving in a biblical way. When we seek the truth behind what we are most grateful for, we naturally want to express it through celebration! Being thankful isn’t feeling accountable to return favors or match another’s generosity. Celebration and expression don’t have to cost a thing. “Faithfulness of God was a fresh reality in return to the land.” (NIV Study Bible Notes, 1 Chronicles) In many ways, we need a fresh dose of real thankfulness. Hold true to the definition of thankfulness Thanksgiving brings throughout the entire year. 2. Look at reminders of true thanksgiving. The world and our daily lives are full of distractions and derailments. Our minds can easily float down lanes of hopelessness and unsatisfaction unless we’re astute to remind them. To keep the true definition of thankfulness top of mind year-round, put it somewhere it can be seen often. The morning coffee station, work cubicle, laptop or phone screen, or stuck on the dash of our vehicles. 3. Voice your thankfulness and repeat. Even more effective than just looking at the reminders we’ve strategically placed to aid our minds in retaining the true definition of thankfulness, is speaking it out loud. In order to train our minds to trace the tracks of positive and life-giving thoughts, we can verbalize the values we strive to maintain until it becomes a regularly circulated mindset. In times of trial and tribulation, it’s not easy to be thankful for the good things in our lives. Especially for those for whom the holiday season is difficult to bear. Nevertheless, repeating God’s truth helps us take hopeless thoughts captive and maintain hearts full of gratitude. For when we seek Him with all of our hearts, He promises we will find Him. 4. Make it tangible – make a list. Thanksgiving isn’t only an idea or concept to right our hearts to the proper position of gratitude. It’s a tangible reality that surrounds us daily! In order to keep thanksgiving at the top of our minds and center of our hearts throughout the entire year, make it tangible. Our lives run on lists and reminders. Thanksgiving should be in the mix. Several years ago, I began writing my prayers down. I picked the top five things I am consistently thankful for in my life and began drafting my daily prayer of thanks. Journaling prayers isn’t something we’re all comfortable with but listing what we are grateful for each day can be. A daily habit of recalling these things assures we don’t take them for granted. Many days, we’ll list even more than three or five things! On trying days, we’ll at least be able to rally those we have gotten in the habit of reciting. 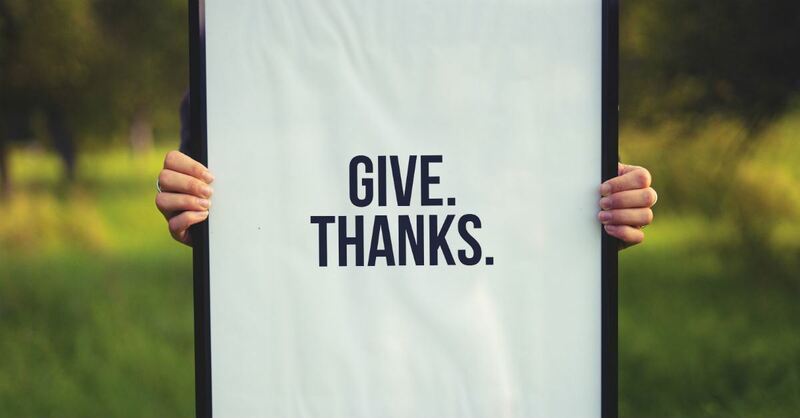 A simple list of thankfulness goes a long way. 5. Express thankfulness before engaging with technology. Swiping and scrolling through social media can become mindless. I’m the biggest offender at times, and I have to reset my priorities via a set timer on my phone to alert me to put it down! How powerful an impact could we all make, if before we started to mindlessly scroll, we aired out our thankful hearts? Amidst all the clamor, we could make a sizable impact. Thankfulness is an expression, acknowledgement, a celebration of gratitude! In order to genuinely make a shift towards year-round thankfulness, an authentic change of heart is required. In the one place where we all put our best foot forward, are we airing out our thanks? A daily challenge to do so might inspire others to follow suit. Give thanks! Share how God has been good today. Let others know His love endures forever. 6. Plan for ways to help others throughout the year. Now that we’ve found reasonable and practical ways to keep our hearts centered in thankfulness year round, it’s time to talk about giving it away! Because Thanksgiving kicks off the holiday season of giving. This time of year we are actively looking for ways to help others. Rather than just cram all of our generosity into a month or two, what if we made a plan to spread our holiday cheer throughout the entire year? Maybe, at Thanksgiving, we can kick off another whole year of giving. Start by grabbing a calendar for the new year, and discuss projects, people, and places that need help. There are often so many options in church giving catalogs and holiday campaigns that we cannot do them all! Each month pick one! Even if it’s putting a shoe box together in June to ready for the November pick-up date, it’s a way to keep the giving going all year round. 7. Celebrate thankfulness with loving outward expressions. Thanksgiving is not just an internal reflection of gratitude, but an outward celebration of it. Jesus said that love was the greatest and most important concept and command that we grasp as Christians (1 Corinthians 13:13). When our thankful hearts express themselves, we are loving people as He would! A thankful heart looks to open the door for someone, perhaps the struggling mom with the double stroller. Making a list is an efficient way to look at just how practical and easy these simple notes of everyday thankfulness can be, but after a while it becomes a happy habit that feeds our souls. Take the neighbors garbage cans back up to their house each week after trash pickup. Get someone’s mail and take it to them when it’s cold or rainy outside. These small outward expressions of thankfulness catch on like wildfire. 8. Slow down and look out for others. There are organizations that abound in every community and across the country and world to help those in need. However, the most hurt might be happening right outside our front door. Often, we run through our day focused on our own footsteps, making sure we don’t trip or get our shoes dirty. But when we look up, we are able to notice the people God has placed around us. We start to greet others, and they greet us. A smile and a wave might not seem like much, but to someone who feels invisible and hopeless it is. Look outside. Look up. Find those that need a listening ear or helpful hand. We are loved by a Father who never leaves us, forsakes us, and comes to our rescue. With hearts full of gratitude for our God, let’s look out for others. 9. Tell other people you’re thankful for them! Give the gift of words. What if we all sent one thank you note a day? Via mail, e-mail, or even test message? Taking the time to tell people why we are thankful for them is a rare gift. Amongst all the other habits we’ve laid out on the table here today, this one might be the most impactful. We all battle negative self-talk and comparison. Interrupt it in another’s mind with a kind note. Make a list of people and check them off one day at a time. Start with the people closest to you and branch off into those that have impacted your life and faith. I’ve even written thank you notes to authors and pastors that I have never personally met before! Tell people you’re thankful! It’s heart-filling for both ends of the equation. Tithing is a great way to continue giving year-round. Many theories abound about the correct amount and proper way to tithe. Whether it’s a certain percentage of our income, or a product of heartfelt praise, having a plan to give to the church is a wonderful way to practice thanksgiving. God calls us to tithe, but His intention is never to make it legalistic. I once heard a sermon about tithing where the pastor reminded, if we are doing it just to say we have done it, then we have missed the point. Our loving Father’s command to tithe is a product of His good will and purpose for our lives. As Christians, we must take the issue of tithing to God, and search His Word for the truth to apply in our own lives and methods of giving throughout the year. For more verses about tithing, click here.